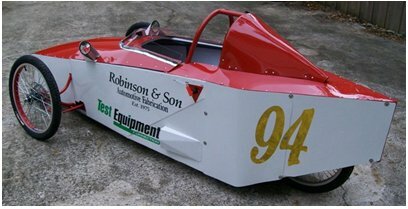 The 2012-13 Electrathon Racing season was a strong one for our lab technician Jim Robinson, and his dad Jim Sr. Between the two sponsored electric vehicles, they competed in 12 events garnering one 5th place, five 3rd places, three 2nd places, and three wins; their best season yet! 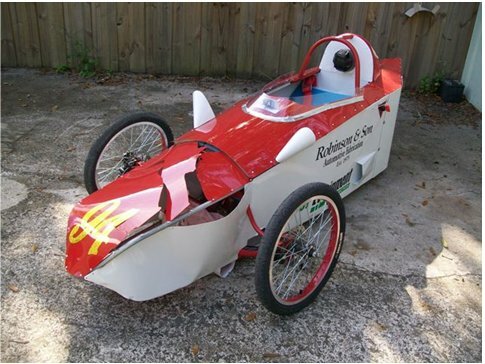 The success of the TECC / Robinson & Son team’s Silver Bullet cars over the last year has brought some notoriety throughout the Electrathon community in Florida and Georgia. In June, Jim Sr. was invited to present a seminar to a group of high school teachers in Quitman, Georgia. The presentation, in turn, led to the sale of a few Silver Bullet cars, including Jim Sr’s # 94 car which was purchased in September by a high school in Augusta, Georgia. Suddenly finding himself without a car and the opening race scheduled for November 16th, it was “crunch time” for Jim Sr. Learn more about Electrathon America here. The Robinsons had begun construction a year previous on an electric vehicle they dubbed “the streamliner” because of its enclosed rear wheel and driver compartment. It is actually an updated version of a car that Jim Sr. built nine years ago. The original car had lever type steering and used a six-speed bicycle derailleur. It was heavy, frequently plagued by mechanical problems, and Jim Sr. never really liked the lever steering. Influenced by several years of Electrathon experience, the derailleur was eliminated from the design to lose weight and enhance reliability. The lever steering was exchanged for a more conventional steering bar with a tilt-away column to ease driver entry and egress. Compared to the Silver Bullet cars, the streamliner’s driver compartment was moved forward slightly, the nose shortened, and the batteries moved behind the driver’s seat back. The overall shape is aerodynamic and attractive. As it turned out, the car was ready by the November 16th deadline, but the weather wasn’t. Inclement weather forced postponement of that race until January. That meant the opening race would be December 7th at Middleton high School in Tampa, the roughest track on the circuit! Lab Tech, Jim Jr, was obligated elsewhere on the 7th, so Jim Sr. took the new streamliner to Tampa alone for its debut. As soon as it was unloaded in the pit area, the car was swarmed by onlookers and fellow participants. Jim Sr. answered lots of questions and demonstrated the tilt-away steering column several times. In the first race everything was going well. Taking it easy for the first 15 minutes, running in the back of the pack, but staying on the lead lap, Jim Sr. was just getting used to the car’s handling and “feel”. He increased the pace then and started picking off other cars. By the 45 minute mark he had made it up to 2nd place, chasing leader and waiting for an opportunity to pass. Then, with 12 minutes to go, the handling suddenly went away on the right-hand turns – the left front tire was slowly going down. Jim Sr, forced to slow his pace, limped home in 3rd place overall behind the Electrocutioners (Andrew Stanley) from Orlando and Tiger Racing (Rodney Schreck) from Miami. Between races, the left front tire was changed and the usual routine of checking spokes, chain, etc, was completed. When the 2nd race started everything seemed good again. The car was performing as expected and the handling was restored. Then, on the 4th lap, entering the hairpin turn just before the start/finish line, the steering broke. The new #94 car went straight from that point and hit a concrete parking bumper. When a car with 2 inches of ground clearance hits a solid barrier that is 6 inches tall the car becomes airborne. The car barely missed the announcer and his sound system; landing between his equipment and the trailer he uses to haul it! Jim Sr. got a bruised left knee and a severely sprained right ankle, but no broken bones; some Tylenol and ice packs for a few days will fix him. The car didn’t fare as well; it will require major “surgery” to its nose before it runs again. As it turned out, the cause of the crash was a bolt that dropped out at the bottom of the tilt-away steering column. Often, when a fabricator is working on a new design, he will use bolts with ordinary nuts installed “finger-tight” because assemblies sometimes will be removed and reinstalled numerous times. Those “temporary” fasteners are meant to be replaced with more permanent ones. Such was the case here and, in the rush to complete this car in a short time, Jim Sr. simply overlooked replacing that very important nut with the self-locking piece that it needed. The good news is that Jim Sr. was credited with 2nd place. It seems that all but one of the other competitors in the Open Class had mechanical problems and turned fewer total laps than the Robinson & Son / Test Equipment Connection entry! This year, for the first time, there will be a season-long points championship and starting the season with a second place finish keeps this team in contention. Good luck to our racing team this year! This entry was posted in Site News and tagged Electric Racing. Bookmark the permalink.